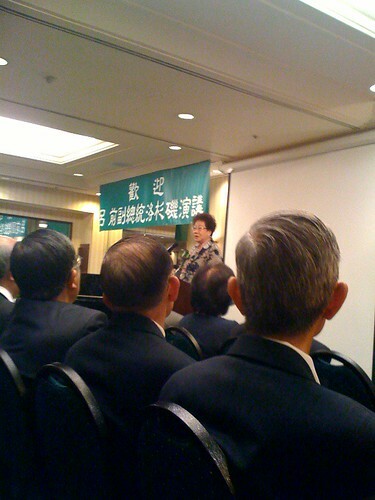 Former Taiwan Vice President Annette Lu speaking on Independence Day…, originally uploaded by !!! :: jozjozjoz :: !!!. As a journalist, what particularly resonated with me about her talk was that she was working on putting together new “newspapers” and publications to better tell stories issues facing Taiwanese people and Taiwan as a nation. She recognized the power of media and wanted to harness it in the next chapter of her life. After her speech was over, a huge line of people waited to have a moment of face time and personal contact with her. I waited with my Mom, who wanted to thank Ms Lu for being such a visible and prominent woman leader in Taiwan. My Mom then mentioned as a side note that Ms Lu reminded her of her own mother (my Grandma) who was an original leader in the fight for democracy in Taiwan. Ms Lu recalled my grandmother as “a feminist leader of Taiwan.” My Mom also briefly introduced me as her daughter, “…who has been into journalism since she was a teenager,” she said. The event was wrapping up and we began to head out. My Mom realized that after the speech and the long wait to meet Ms Lu, it would be a good idea for her to use the restroom. I said I’d wait for her in the hotel lobby and sat down in a chair, checking my phone and looking at pictures I’d taken from the event. Suddenly, I realized there was a change in the energy of the room– people were buzzing– I looked up to see the Vice President standing in front of me. I was shocked to see that the guest of honor had left her meet and greet area and had come to talk to me. I told her I was hoping to go to Taiwan later that year to gather stories and research. She wished me luck and said I should reach out if I needed help. And with that, she turned and walked back to the line of people waiting for her, just as my Mom returned from the restroom, appalled that I was so disrespectful to speak to the Vice President without having the courtesy to stand up! I was so surprised and shocked at this interaction, I totally lost my mind of all etiquette and protocol, that I had indeed stayed seated while the Vice President of Taiwan addressed me. The next thing I knew, random Taiwanese people were rushing up, asking why the VP had come to talk to me. Many of my mother’s friends had no idea who her mother was, so instead of leaving, we were trapped for another half hour in the hotel lobby as my mother interacted with everyone. I did indeed take a research trip to Taiwan later that year, but my path has not yet crossed again with that of Ms Lu. It is my hope that after all these years of the project being on the backburner, with the reduction of activities in my calendar and the translation help of my cousin Andrew, that I can in finally make some progress in recording and documenting my grandmother’s unique contributions to Taiwan’s history. Originally posted on Facebook, as a response to a Facebook “On This Day” reminder about my original Twitter post from 2009. Photo from blog post from 7/4/2009.